Hi everyone, welcome back to my blog. 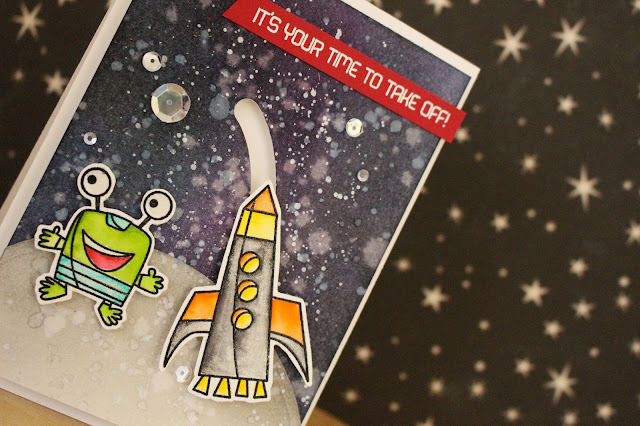 Today I have another space/galaxy themed card, but this time I'm using MFT supplies along with making an interactive card. To begin my card today I started off with stamping and colouring my images. I'm using the MFT Out of This Word stamp set today. 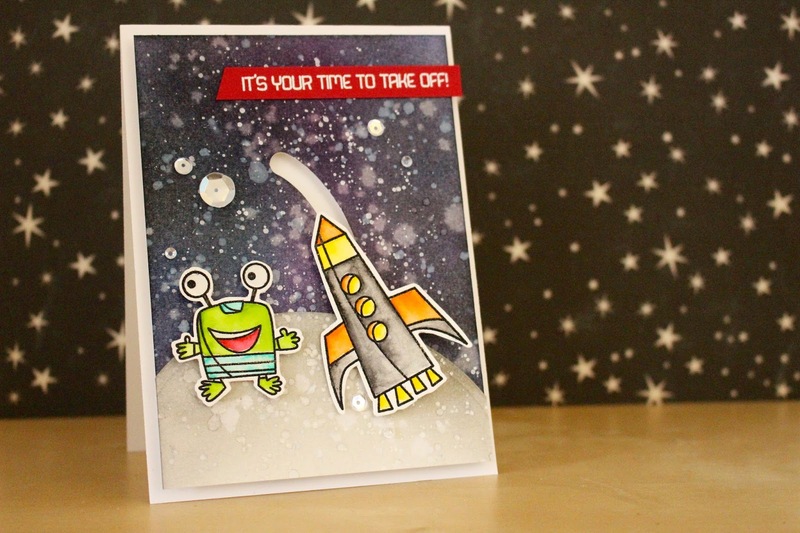 I stamped my images with my Mini MISTI due to stamping on textured watercolour paper. I wanted to have to option to stamp twice if I needed too. I stamped the two images with Versafine Onyx Black ink and then clear embossed over them to keep the watercolour contained when I colour them in. To colour my images in today I'm using Zig Clean Colour Real Brush Markers and these are so fun to use! Once my images were coloured I dried them and fussy cut them out. I then made my background and moon. For the background I used various pinks, blues, purples, greys and a black and blended them altogether to make a fun background. I also splattered some random shimmer and paint on the background also. Check out this video to see how it was done, since it's not featured in this particular video. I then dried that with a heat tool also and made the moon. To cut the moon shape I used the edge of a piece of watercolour cardstock and an oval die and cut it out, I then also blended some greys on to make it look realistic. I also made sure that was dry before I moved on. Now for the interactive portion of the card, I used the new Surf and Turf dies from MFT that were released in a recent card kit (it is sold out now, but the dies will become available in the coming months). I took out the curved die in the set and cut that out of the background panel. I then used the circle dies that came in the kit as well and placed one under the panel, I then adhered a spin and slide disc, also my MFT on top of that piece and then the second circle die on top of the spin and slide disc. I waited for that to be dry to check how it would work. Once it was dry I also added a second one so my image would only slide, not spin. I then adhered my rocket onto the top of both the circles. I also adhered my alien next to my rocket on the moon. I then cut a strip of red cardstock and stamped and white heat embossed a sentiment on to it and then adhered the strip onto the top right hand side of the card. To finish up the cad I added some very dimension foam adhesive onto the back panel and then adhered it to a white card base. I then adhered some clear sequins by Simon Says Stamp to complete the background.